This quick and easy Mexican Chicken Quinoa Casserole is a healthier way to enjoy Mexican food! 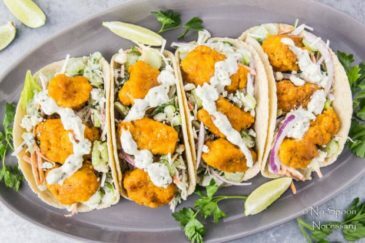 With only 12 ingredients and 15 minutes of prep required, this is the perfect weeknight dinner! Can we talk about casseroles for a hot minute? I want to know, what are your thoughts on them? Love them? Hate them? Or, are you totally indifferent? As for me, growing up I always dreaded casseroles. They evoke images of sad, overcooked vegetables and weird canned cream of something soup. * Needless to say casseroles, or bakes, were a hard ‘no’ for me. But, casseroles done right? You know, the ones with tender-crisp veggies, a moist, flavorful filling and a generous amount of bubbly cheese?! Gimme ALL of that! Those casseroles I fully support eating, because they are not only delicious, but they are also a total life saver on busy weeknights! The casserole I am sharing today is honestly one I could eat weekly for the rest of my life. 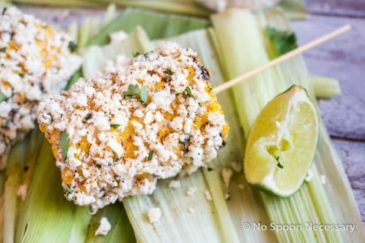 It’s Mexican food meets healthy and delicious with the perfect amount of cheese. 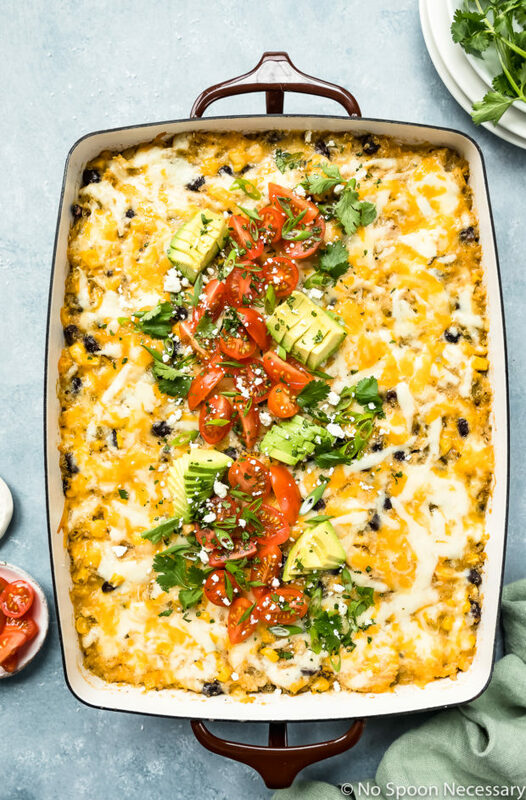 Basically, this super easy cheesy quinoa bake is lightened up Mexican comfort food that is so good you may want to say sayonara to Taco Tuesday and opt for healthy Mexican Monday instead. *There was one exception to the “just say no” to casseroles situation in my youth – my mother’s broccoli casserole. I honestly lived for that dish and it’s still a favorite of mine to this very day. Fluffy, nutty quinoa mixed with tender, shredded chicken, mild green chiles, roasted kernels of corn, hearty black beans, pungent yellow onions and a generous amount of sharp colby jack and soft mozzarella cheeses. 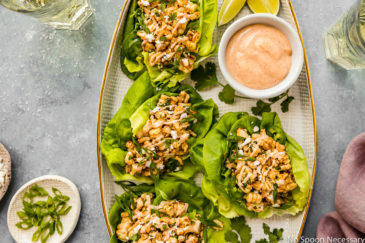 Baked until warm, melted and bubbly, it’s the perfect fix when you are craving Mexican food, but you also want a healthy dose of protein, fiber and general feel-good eats. 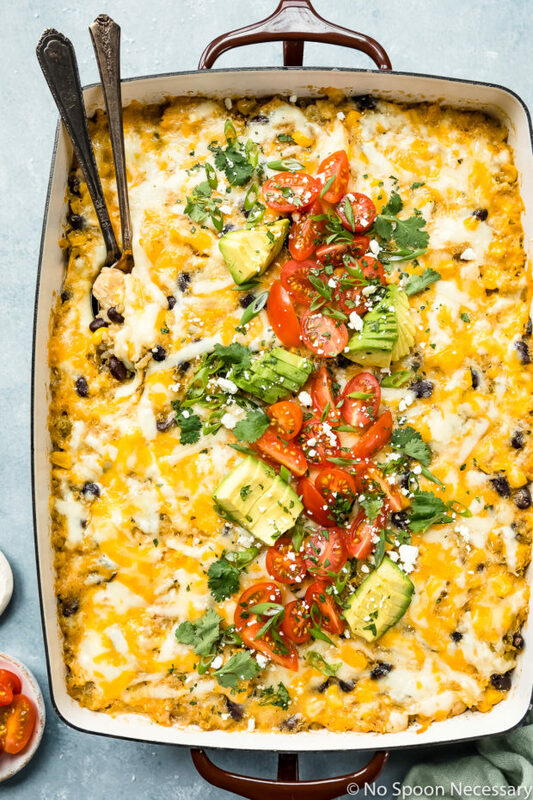 This Mexican Chicken Bake is literally going to be your weeknight dinner lifesaver. 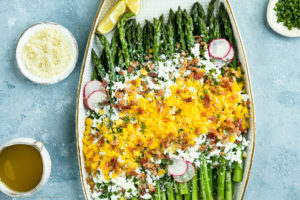 With only 12 ingredients and 15 minutes of prep, you can simply throw everything into a casserole dish, give it a good stir, top with shredded cheese and bake. I mean, dinner doesn’t get any easier than that! How to make a quinoa casserole? Quinoa casseroles are quick and easy to prepare, which make them perfect for busy weeknight dinners! To make a quinoa casserole, simply cook the quinoa according to package directions and transfer it to a large bowl. Add in chicken, salsa (or sauce of choice), vegetables and seasonings then stir well to combine. Next, fold in shredded cheese and season generously with salt and pepper. 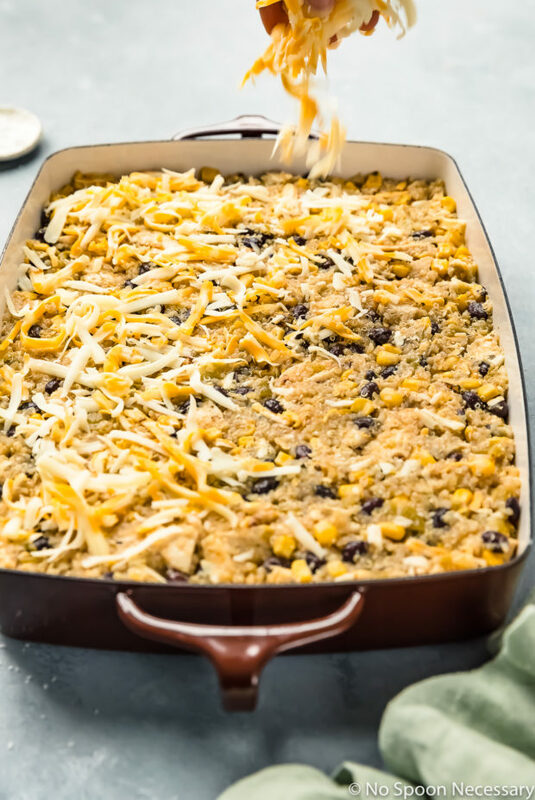 Transfer the quinoa mixture to a greased 9×13’’ baking dish and top with more shredded cheese before baking. How long to bake a quinoa casserole? 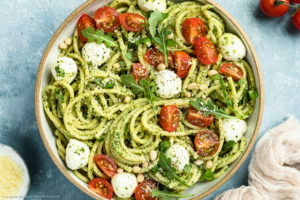 Bake a quinoa casserole in an oven preheated to 375 degrees Fahrenheit for 22-25 minutes, or until bubbly and the cheese is melted. Can you make a quinoa casserole in advance? Yes, a healthy grain casserole can be made in advance. To make this Mexican chicken casserole in advance, simply assemble the casserole as directed in the recipe instructions, cover tightly with plastic wrap and store in the refrigerator. An unbaked quinoa casserole can be assembled and stored in the refrigerator for up to 2 days. How long will a quinoa casserole keep? Cooked quinoa casserole can be kept in the refrigerator, covered tightly with plastic wrap or in an airtight container, for up to 3 days. Can you freeze quinoa casserole? Yes you can freeze this easy Mexican chicken casserole! Baked casserole leftovers can be stored in an airtight container in the freezer for up to 3 months. Pro-tip: Portion out leftover Mexican Chicken Casserole into individual servings and freeze for an easy microwave meal (perfect for lunches)! Unbaked casserole can be assembled and covered tightly with plastic wrap and then foil and stored in the freezer for up to 3 months. 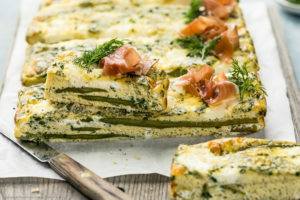 When ready to bake, thaw the casserole in the refrigerator overnight and bake per the recipe instructions, adding 15-20 minutes to the cook time. How to reheat quinoa casserole? In the oven. Cover the casserole with aluminum foil and bake at 350 degrees Fahrenheit until warmed throughout. In the microwave. Place desired amount of casserole on a microwave safe plate and microwave until warmed throughout. What to put in a Mexican casserole? 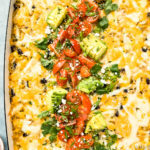 Mexican casseroles are extremely versatile and easy to customize! 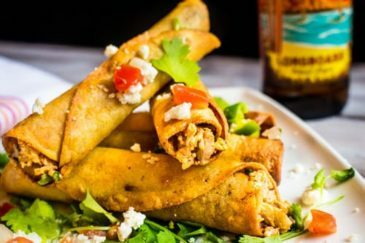 What to serve with a Mexican chicken casserole? 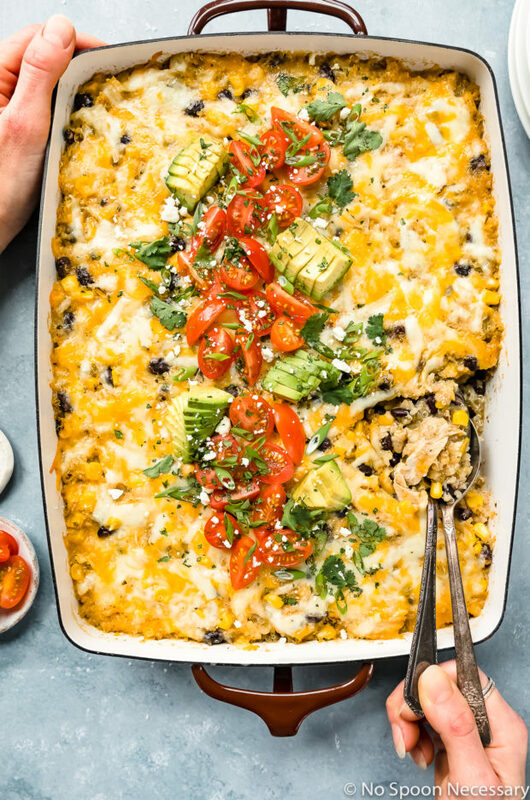 While this Healthy Mexican Casserole is already loaded with super-grain quinoa, protein packed chicken, beans and veggies, there are a number of side dishes you can serve to round out this meal. This Mexican Chicken Quinoa Casserole is packed with all your favorite Mexican flavors and it’s easy to make! 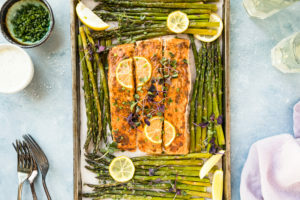 Loaded with protein and fiber, this one pan bake is a delicious spin on comfort food and perfect for weeknight dinners! Until next week, friends, cheers – to casseroles done right! 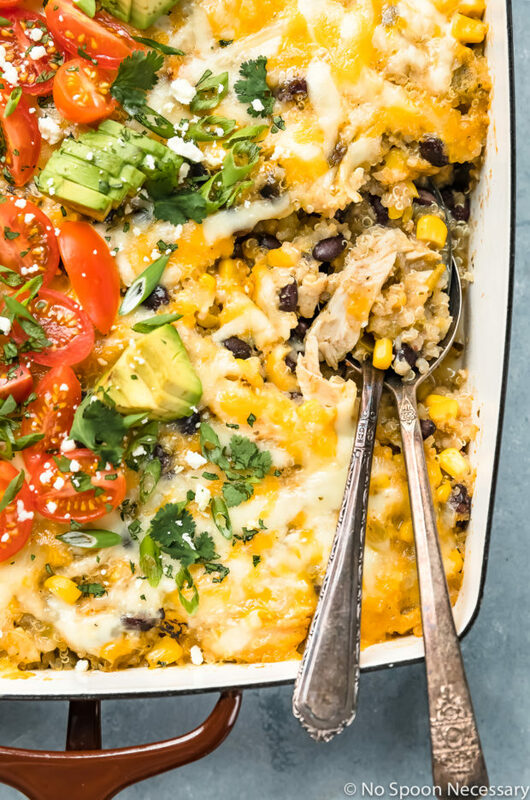 This quick and easy Mexican Chicken Quinoa Casserole is a healthier way to enjoy Mexican food! With only 12 ingredients and 15 minutes of prep required, it is the perfect weeknight dinner! Preheat oven to 375 degrees F. Grease a 9x13’’ baking dish (or similar sized casserole dish) with non-stick cooking spray. Set aside. Cook the quinoa according to directions on package. Once cooked, remove from heat, fluff and transfer cooked quinoa to a large bowl. 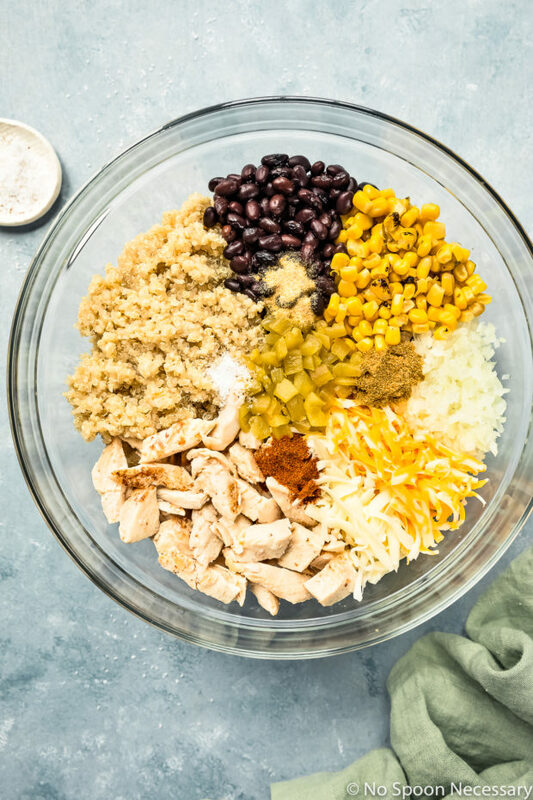 Mix casserole ingredients: Add the cooked chicken, salsa, onion, green chiles, corn, black beans, garlic powder and chili power to the bowl of quinoa. Stir to combine. Fold in 1 cup of jack cheese and ½ cup of mozzarella. Generously season with salt and pepper. Transfer the mixture to the prepared baking dish. Top with the remaining cheeses. Bake for 20 minutes or until the cheese is melted and bubbly. Serve: Remove baking dish from the oven and top with optional garnishes. Serve and enjoy! If your quinoa is on the dry side, use 1 1/2 cups of salsa. Baked quinoa casserole leftovers can be stored in an airtight container in the freezer for up to 3 months. Pro-tip: Portion out leftover quinoa casserole into individual servings and freeze for an easy microwave meal (perfect for lunches)! Unbaked quinoa casserole can be assembled and covered tightly with plastic wrap and then foil and stored in the freezer for up to 3 months. When ready to bake, thaw the casserole in the refrigerator overnight and bake per the recipe instructions, adding 15-20 minutes to the cook time. Honestly I’m on the fence about casseroles…it all depends. Typically if it has Mexican or Italian origin, I’m in. Some casseroles can be too monotonous, but not this one. And I love quinoa, so most definitely putting this one on the menu!! This casserole is absolutely perfect for weeknight dinner! And using quinoa, genius! Packed full of flavors! I am a casserole lover! I love all the flavours and texture together in one bite. 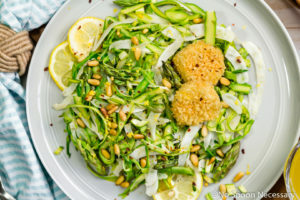 This one looks so perfect and I love the use of quinoa! 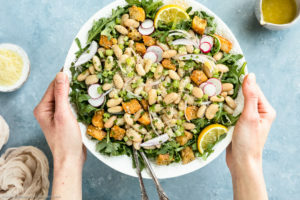 I love that you suggested adding roasted sweet potatoes–I’ve been on a huge sweet potato kick lately so I’m totally trying this with a few mixed in :). Sounds fabulous! Have a great weekend, Chey!